A friend of ours gave birth a couple of weeks ago, to a gorgeous little baby girl. What a wonderful excuse to do a spot of sewing! 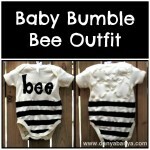 I made a “B” onesie, as this is the first letter of the new little bub’s name. I used a yellow size 0000 onesie. The salmon fabric was part of the bargain $5 green bag fabric stash I had bought from Reverse Garbage (and saved from landfill). 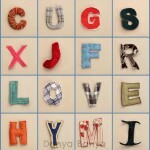 I used the same B template that I used for making my fabric letters. I traced out the B on the reverse of the fabric and cut with pinking shears (zigzag scissors), pinned and sewed using a medium straight stitch around the edges and also though the middle of the B shape. (Although if I were to make it again, next time I’d use a more decorative stitch for the middle). The trickiest bit was making sure to not catch the rear side of the onesie and thus accidentally sew both sides together. I’ll admit I did catch the rear side once, but luckily I realised straight away and was able to back pick a stitch or two and keep going. Once it’s washed, the pinked (zigzagged) edge should “rag up”, changing / improving the look. Can you see all the areas where I haven’t been too careful with my stitching? I encourage you to please notice the little flaws. I am a firm believer in allowing little flaws in homemade or upcycled things. The benefits are two-fold – firstly, it allows the maker to have more fun, take more risks, and try new things with their sewing or craft. 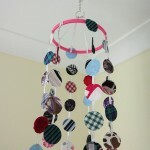 And secondly, the little flaws (the ones that add charm) are how you can tell something is homemade or upcycled. So many things these days are too perfect. The little flaws are where all the love is. And for the second onesie, I made this wee little Christmas outfit. This time I used a green size 000 onesie, which should hopefully be the right size for a 2 month old to start wearing around early December. The green corduroy was from a child’s overalls that were handed down for me to upcycle as they were now a decade or so out of fashion. The white ribbon “tinsel” I had bought as part of a bulk ribbon purchase off eBay and the rest of the fabric were scraps from recent projects that I compulsively save. The star on the top is two little triangles of gold ribbon sewed together. I used a large zigzag stitch. I sewed on the outline of the tree and the stump first, using pale green cotton. Then I sewed on the white ribbon tinsel using white cotton. Then I switched back to the pale green cotton to sew around the little coloured circles. Again the trickiest bit was not accidentally catching the rear of the onesie. Constantly turning the material to sew around the circles was a bit fiddly too. Then I flipped it over and sewed some holly on the bottom. Again I just used a simple large zigzag stitch and sewed around everything individually. Here they both are, wrapped lovely and ready to pop in the post. I used some of JJ’s art as wrapping paper and card. The paper is just two of her paintings on recycled paper, and the card is something she made at playgroup one day. I’m sure that my friend will love them much more than store bought stuff! So, same concept. The only changes I made were that I made the star at the top out of a circle of red & gold ribbon (which actually didn’t turn out as well) and I sewed a smaller zigzag stitch for the tinsel. Oh and of course the placement of the circles, simply because I didn’t plan either of them. And here it is flipped over. You can see some more pics of Bee’s Christmas onesie in action here. Or you can also find all our sewing and appliqueing posts here. And here are all our Christmas activities.